The most comprehensive reference available on equine surgery, this book prepares the veterinary surgeon for managing each surgical condition by understanding its pathophysiology and evaluating alternative surgical approaches. Explanations describe how to avoid surgical infections, select and use instruments, and perfect fundamental surgical techniques including incisions, cautery, retractions, irrigation, surgical suction, wound closure, dressings, bandages, and casts. World-renowned contributors include over 70 of the most expert equine specialist surgeons, each providing current and accurate information. Complete coverage of all information needed to study for the American and European College of Veterinary Surgeons Board Examinations makes this edition an excellent study tool. Section on anesthesiology and pain management prepares you to manage these critical aspects of any surgery. Extensive, up-to-date orthopedic coverage includes joint disorders and joint trauma. Section on integumentary system contains information on wound management, reconstructive surgery, and skin grafting. Section on the alimentary system covers postoperative care, complications and reoperation guidelines. New techniques in vascular surgery keep you current on best practices. 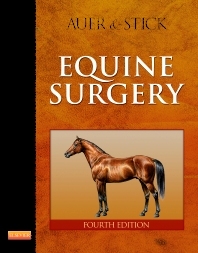 The most comprehensive text on equine surgery focuses on diagnosis and treatment to provide equine practitioners with the information they need to effectively manage and surgically treat equine disorders. Broad collection of high-quality images that were taken by the contributors during surgical procedures to provide the best instructions for other surgeons.